First book in a long time to make me me laugh out loud! William Alexander makes the quest for the perfect crust (crumb, actually, since he spends the better part of one year trying to get holes in his bread) sound both like the single-minded obsession of a slightly demented home baker (when he isn’t baking, Alexander is director of technology at a research institute) and a somewhat comical endeavor which ends up involving the whole family one way or another. Yes, growing in his garden, you read that correctly. Not satisfied with flour that could be bought at the supermarket, Alexander had decided to grow his own wheat (from scratch, literally) and, with the help of his wife, Anne, a medical doctor, planted four beds of winter wheat. Discovering how he and his family dealt with the harvesting (“after a few useless swings with my old, rusty scythe – essentially a sickle on a long pole – I went into the basement and emerged with my not-quite-as-rusty hedge shears,”) the threshing (first with an old broom, then with a shovel, then with a mallet), the winnowing (first relying on the wind to separate the wheat from the chaff, then resorting to more technologically advanced solutions) and the milling (using an Indian artifact grindstone), not to mention the efforts which went into building a brick-oven, makes for fun and instructive reading. Along the way, the author reviews the history of bread, learns about the various types of flour, reflects on the link between bread and religion, researches the origin of pellagra, a mystery disease that has disappeared in our part of the world thanks to the systematic addition of niacin to white flour, muses about modern milling, deals a swift blow to bread machines (they seem “to have been designed to reproduce not artisan bread but commercial bread, the cellophane-wrapped kind”) and has with levain an encounter that changes his life. He actually becomes so attached to his that he takes it with him to France: his description of how he gets it through security at JFK is most entertaining. My only reservation about the book has to do with the frequent asides about the author’s libido which, I suspect, were put in to make the book more appealing to a general public perceived as having voyeuristic tendencies (although I don’t know that voyeurs would rush to purchase a book entitled 52 loaves). When the book begins, Alexander’s loaves are so dense his kids refuse to slice them themselves, “it was so difficult – not to mention hazardous,” but they eat them anyway and say they are pretty good, unwittingly irritating their Dad who deems them “lousy” (the loaves, not his kids!). Deeply unsatisfied with his bread, he resolves to take a scientific approach, to read books and to talk to bakers. He thus discovers preferments, learns the merits of gently folding the dough instead of punching it down à la Julia Child, visits yeast factories, goes to baking school in Paris (at the Ritz, no less), flies from Paris to Morocco to bake his bread in a communal oven (Alexander’s description of his stay in Asilah is both hilarious and moving) and, last but not least, spends a few days at Saint-Wandrille Abbey in Normandy where he has been asked to teach the monks the forgotten art of bread-baking. Alexander fares better with the monks than with hotel clerks. Not being particularly religious himself (“Would you call yourself an atheist, Dad?” asks his teenage daughter. “Not as long as Grandma’s alive”, replies the author as he kneads), he expected his experience at the Abbey to be one of an outsider looking in but it turns out quite different. He devises for the monks a bread that can be made without compromising their attendance at the seven daily offices, the performance of their tasks and their participation in study groups, the “pain de l’Abbaye Saint-Wandrille“. You will find recipes, a photo tour of the Abbaye (including a video clip of the ancient mixer at work) and other delectable tidbits on William Alexander‘s website. 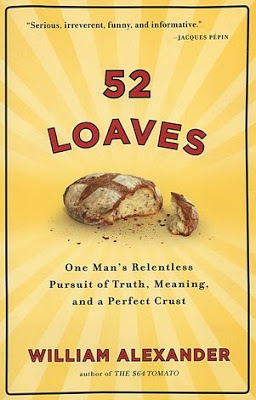 I just finished reading "52 loaves" a couple of weeks ago and thoroughly enjoyed it. William Alexander really captured the obsession that plagued all of us once we venture in that twilight zone called 'artisan baking'. Well, I jumped over here…. and now you did it: I am getting the book! Yep, this book is kind of a must-read for those of us who have been bitten by the artisan bread bug. Hope you enjoy it, Sally! This morning June 09, our local NPR radio station WAMU in Washington DC broadcasted the Diane Rehm show where she interviewed William Alexander about his book '52 Loaves'. You can Googled it and listen to the rebrodcast on the Web. Very informative. Thank you, I've been looking for facts about this subject for ages and yours is the best I have found so far. I love the author's description of all things French, from the quirky way general strikes operate to the invariably cheerful tone used by hotel clerks to deny a tourist's legitimate requests.